Put your empty overhead space to use! The SUP Ceiling Rack is a great space saver for your home, garage, retail store or SUP yoga studio. It's a simple design that allows you to store your paddleboards overhead rather than tripping over them and damaging your boards. The open end of the U-shape design provides easy access to your SUP, so it's always ready when you are. Need 2x the storage? Check out the Hi-Port 2, our double SUP ceiling rack. What SUPs Will it Hold? 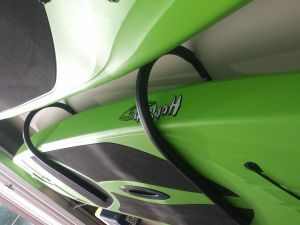 Weight: Holds up to 50lbs, which is enough for most paddleboards plus some extra gear on top like paddles and dry bags. Padded Storage Solution. 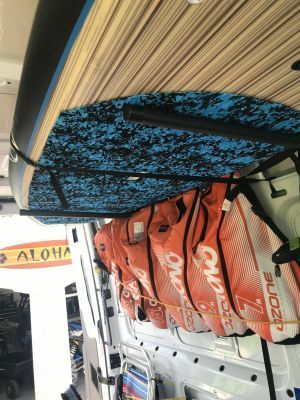 Heavy-duty foam covers the rack where your paddleboard rest, so you don't have to worry about dings while you're inserting your SUP or pressure distortions over time to your paddle board. Rack's U-Shape. The bend of the rack is just slightly past horizontal (upward) to ensure your precious stick will not slip out. Distance from top of mounting bar to bottom of arm: 13"
Holds SUPs up to 36"
Use all that space overhead! 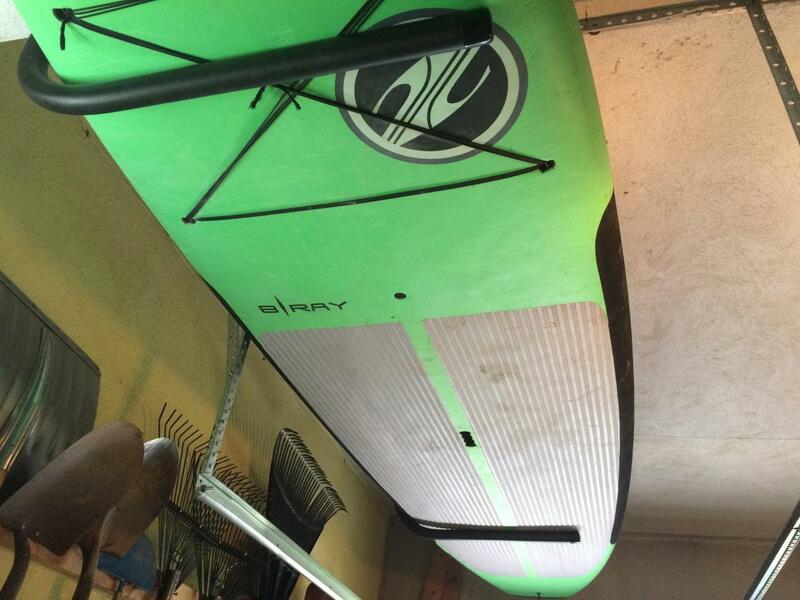 Just look up and see all that unused space just waiting to hold your favorite SUP. 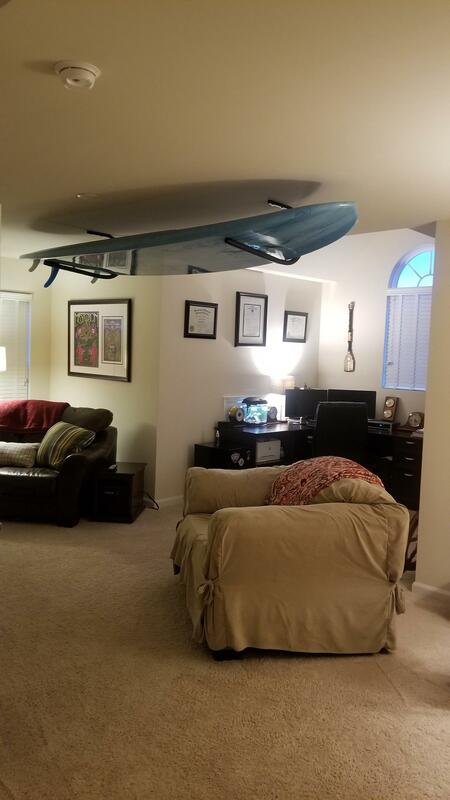 The ceiling is the perfect spot to store a paddle board. If you mount your paddleboard on the wall in your garage you lose a lot of very useful space you could use for other storage. instead mount the very long thin piece of sports equipment tightly against the ceiling and make room for all your other gear! Or keep that extra space to actually park your car in the garage. This is a very simple rack, which is always my favorite. 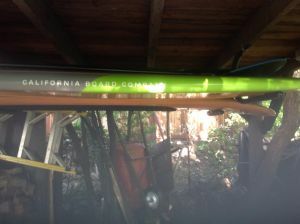 It is a bent piece of square tubing with a thick closed cell foam wrapping to protect your paddle board and its edges. As you can see in the dimensions, there are 10 inches of usable space on this rack. 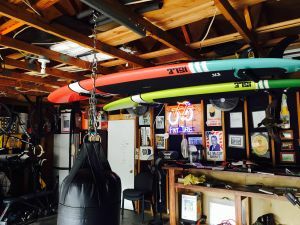 I use one of these in my garage and I have a SUP and a surfboard stacked up together on this rack - utilize all the space to the max! Howdy! I’m Andrew from StoreYourBoard.com. If you're a paddleboarder looking for a great place to store your paddleboard, we’ve got a solution for you. 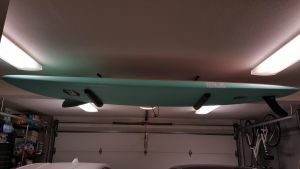 This is the SUP Ceiling Rack. This is a rigid metal overhead storage solution. 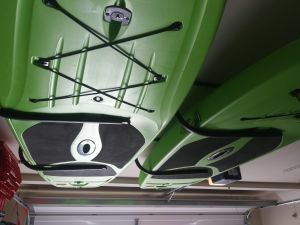 It comes with two steel ceiling pieces and those that you mount to at whatever distance you need to accommodate the length of your paddleboard. They’re heavy. 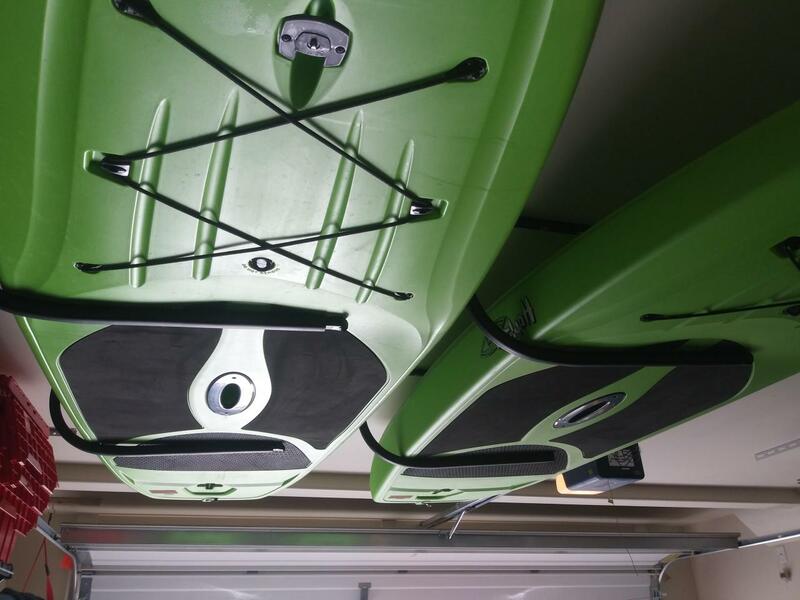 They can hold up to 50 pounds, which will hold the majority of paddleboards. The design is a pretty simple U-shape. You mount this piece to the wall, two screws. It’s padded to protect your paddleboard while in storage. The distances that are relevant to your dimensions – this is 27 inches wide, which will accommodate up to 36-inch wide paddleboards. You’ll know that our board right here at its largest width is about 30 inches. It overhangs the ceiling rack a bit. That’s no problem. The thickness is 10 inches thick, which will fit paddleboards up to that thickness. We’ve got a 7-inch thick paddleboard; there’s still plenty of room above it in the rack. Also to note that when you mount this piece against your wall, the bottom support is angled up slightly. If there’s a little downward weight, it won’t open so as to allow your paddleboard to slip out. It’s a very secure ceiling storage rack. You’ll get two. You’ll mount it to the ceiling, and it’s pretty simple to use. Depending on how high your ceiling is, you have a ladder, you might need another person to help you out. I’m going to get it down myself this paddleboard. Slide out from the front to the back; take care. Put my board down like that. You have another look at the ceiling rack; again very simple. We mount it just over 4 feet apart depending on your board. You make that judgment call. Added ceiling overhead storage solution and now you have it’s pretty simple. Slide the board to the back of the rack. Get it into that cradle. It now sits very secure. You got overhead ceiling storage solution. 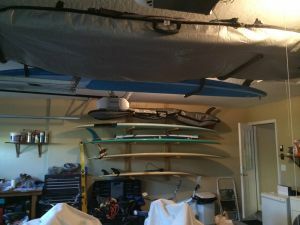 Check it out on StoreYourBoard.com, the SUP Ceiling Rack. 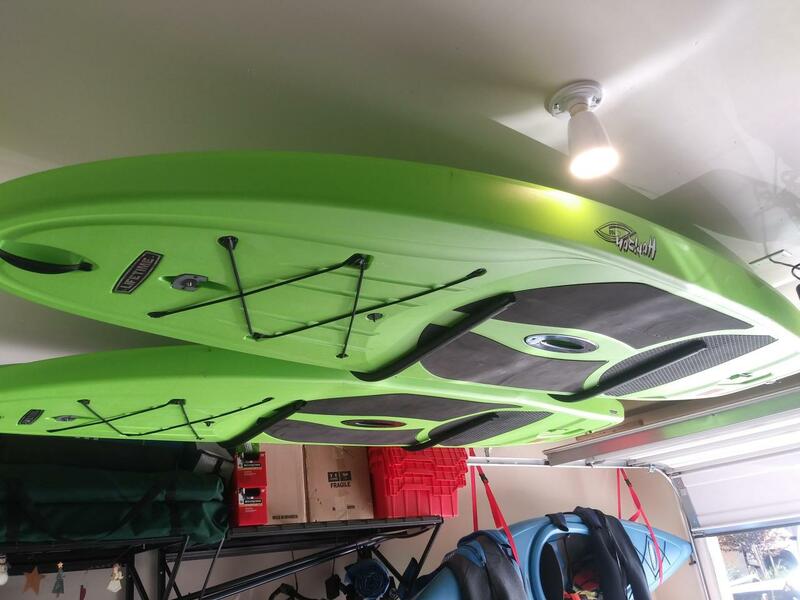 How big of a SUP can this ceiling rack hold? We recommend using it for SUPs that are 36 inches or less in width. The rack arm extends about 20 inches and it is no problem to extend out over that, you just want to make sure the center a gravity is still well within the rack and it doesn't easily tip out. The fact that this rack is bent up on a 10 degree angle past horizontal helps to keep your paddle board in the rack. As for width, this rack has 10 inches of vertical clearance which should fit and "normal" SUP. For the length, this ceiling rack comes in two parts that can be mounted independently. With this it can pretty much accommodate SUPs of any length. What is the dimension of the storage space from ceiling to rack? I would like to store one SUP and one surfboard if possible. There are 10 inches of storage space between the ceiling and the rack. Can this rack store two paddleboards? The ceiling rack can hold up to 50 lbs, and has a 10" opening where the ends of the board sits, so it can hold a SUP and a surfboard, or a SUP and some gear like your paddle, but would generally not be recommended or work well for two SUPs. Better options for storing two SUPs would be a double-ceiling rack, or a rack for multiple boards, or two of these ceiling racks. We have two boards. Can we store both on a set of these? This SUP rack has a 10" inch opening to hold boards. 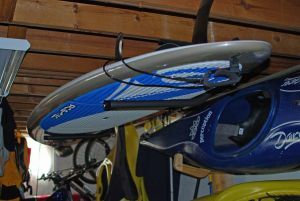 It can be used to hold more than one board, depending on your particular boards - A SUP and a surfboard can easily work on this rack, but two SUPs are generally not recommended. It holds a maximum weight, when properly mounted, of about 50 lbs, so that is something to consider as well. How far apart should the racks be? The two arms on the ceiling rack can really be set up at whatever distance you need them to be, to accommodate the length of the SUP they are holding and the space where you are mounting them. You also want the weight of the board distributed evenly, so you are going to be placing the arms not too close to each other, but more where the board starts to narrow a little. 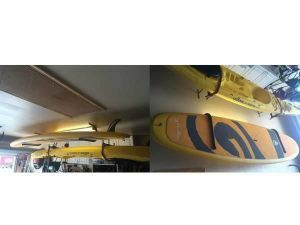 If you scroll through the pictures on this listing, you can see how some of the boards are being held by the rack to get an idea. If I mount the rack above my garage door (opened) will it clear the door? I have 14 inches from the ceiling to the door. Our ceiling rack takes up a little over 13.5 inches in vertical space, so it would be close to fitting in your area above the garage door, and a factor to consider is that this rack might sag a little depending on the weight of the board in it, so that might not be the best option for your space. I have exactly 15 inches of clearance above my garage door, and would be buying this to hang a 12 ft SUP. How much can I expect this to hang down / sag with that size/weight of a board? This SUP ceiling rack will take up about 13.5 inches of vertical space. How much it will "sag", if at all after it is hung, is going to depend on the weight of your board, but we really don't have an estimate of how much, as that is too variable. The ceiling will hold a board up to about 50 lbs, but there may be a little natural give where it is still safely supporting the board. Whether it would sag a full 1.5 inches or more, beyond your 15 inch space/clearance limits, is a potential question mark; it might be a close fit or not work for that space and we couldn't guarantee it would work out. We do have a 90 day No Hassle Return Policy if you wanted to see if it may work (return policy details at that link), otherwise you might want to check whether you have an alternative space with more clearance for either this rack, or a wall rack. Can I put these on a wall for storage? 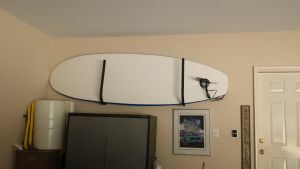 Our SUP ceiling rack could possibly be set up as a wall rack, but how well it would work like that is a question mark. You would be attaching the back plates to the wall, then the 27" long arms would be in front to hold the board. It probably would have enough support to hold the board in that fashion, as long as it was mounted properly to the wall, but it isn't designed or manufactured for that use, so I couldn't guarantee it would, and it wouldn't be my recommendation for a wall rack. Our Naked SUP rack is a good wall rack alternative in this price range, for your consideration, as are these hanger hooks, or for a little more protection for your board, this SUP suspension wall rack is a good choice. Do you have experience using this rack inside? I am looking to mount my board on my ceiling between my entryway and living room area (small condo). Is it necessary to get additional hardware for a drywall ceiling mount? 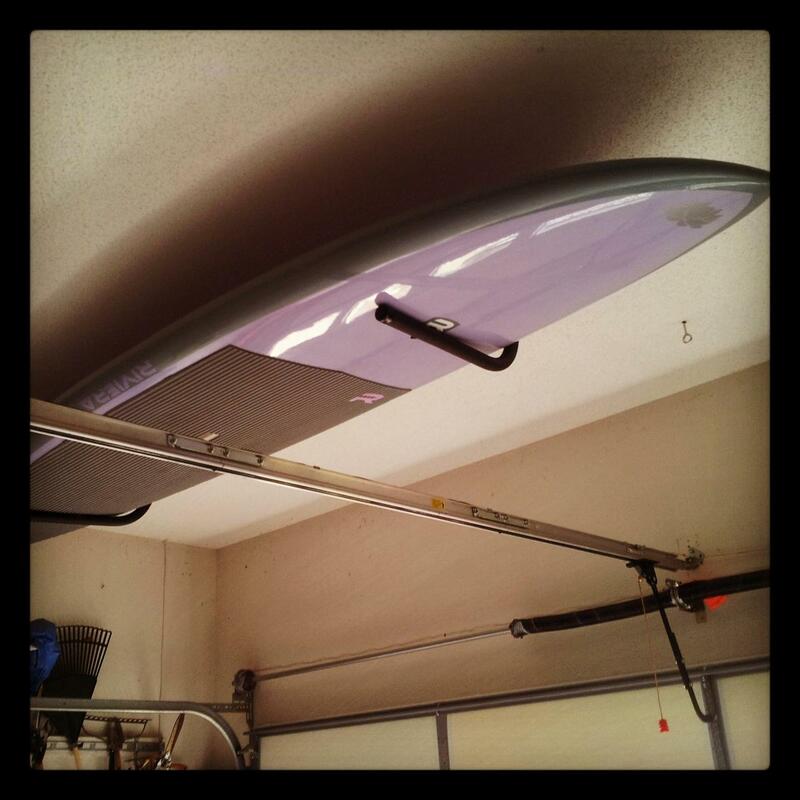 Our SUP Ceiling Rack is intended for indoor use, but it can also be used in a garage. 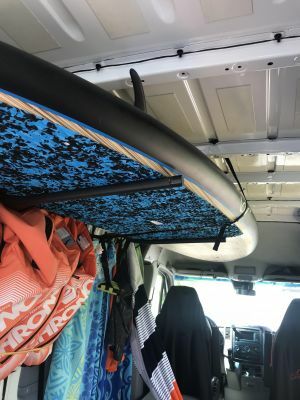 It is a very economical way to use overhead space to store your board inside. It comes complete with all necessary mounting hardware. An important note, your drywall ceiling will have ceiling beams (like wall studs) that this rack needs to be mounted to; you will need to locate those to install it, as using drywall anchors instead will *not* work. 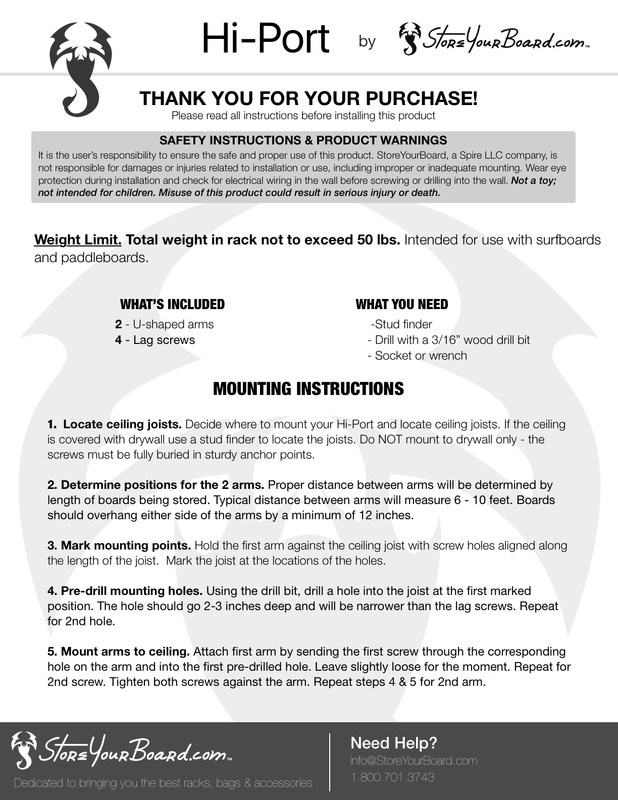 You can find more information about mounting ceiling racks in our mounting & installation guidelines. I have to screw this rack into a cement ceiling. Will the screws that come with this rack screw into cement? This SUP ceiling rack comes with standard mounting software for standard ceilings. To mount this board rack it into a cement wall or ceiling, you would need to purchase additional concrete/brick/masonry anchors, such as TapCons, to do so. Those are available from anywhere that you buy hardware (Lowe's, Home Depot, etc.). I can't guarantee how well that would work, or recommend it though. You can find some additional general guidelines about mounting wall and ceiling racks here. Will this rack with SUP hold up with a dry wall ceiling? This SUP ceiling rack should be mounted to ceiling rafter/beams. You don't want to mount it into drywall only, it won't be properly anchored. Is it okay to hang from sloping rafters? 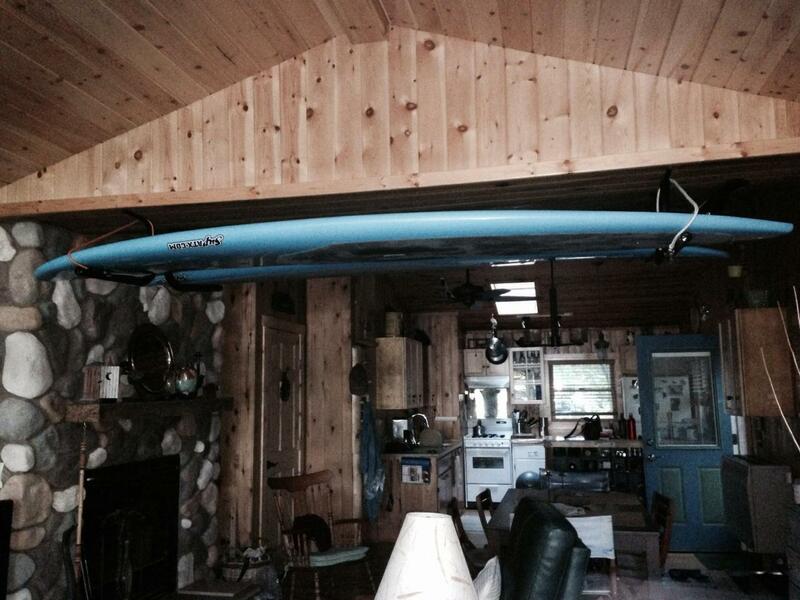 No, this SUP ceiling rack doesn't work if hung from sloping rafters. The angle would prevent the board from being held securely in place. This rack did exactly what it was intended to do for a super good value and easy install! Freed up my garage floor! I bought 2 sets of ceiling mount racks for my boards, and they were super easy to install. A simple product provided a great solution, I'm so happy to have my boards overhead instead of underfoot. We were able to hang my son's growing collection of body boards, skim boards, beater boards.... We hung these vertically on the side yard fence and layered in 3 to 4 boards ! Works great for our small garage! We have a small garage with not a lot of floor or wall space available. These work perfectly to store our boards on the ceiling. It was easy to install, and the board is tucked away nicely up high. Great product. Easy to install and looks good with the board hanging from it. Super easy to install. I purchased 2 sets (2 SUPs) and was able to mount them on ceiling joists in the garage with no issues. My boards are heavy (> 45 pounds) and these mounts still work fine. I only wish I was a few inches taller because I have to stand on a milk crate the push the boards up onto the mounts. ;) Great product at a more than fair price. Very happy with this product! It was half the price of anywhere else I looked. The quality is great. I am not a surfer....but I do live in Florida where hurricanes are a concern. I needed a way to store my hurricane shutters and was looking online when I came across the SUP Ceiling Rack Storage Mount. I decided to buy 2 and I mounted them to the ceiling in my garage. I now store my shutters and mounting hardware on them and they have fit my needs perfectly. I'm super happy with this purchase. It was inexpensive, but seems to be strong enough to do what it is supposed to do. It came with all the hardware that was needed. Love this SUV storage rack. It is just was a I was hoping for. Gets it up off the floor and out of the way, but safe. 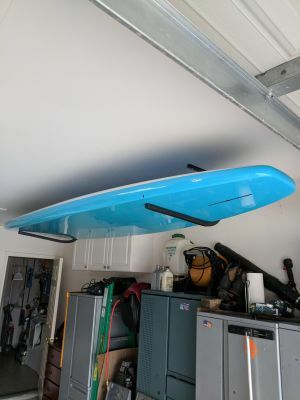 Although I have not mounted the item, it appears well built and should support and protect my sup from garage traffic (kids and wife). Hahahahaha! No seriously, I like it and will likely check out a stand for my kayaks. Thank you! I have purchased two sets of these wracks, they are very easy to install and even my little wife can take down her board and put it back thanks to the online video showing how to. the second set we got for her friend who lives on Padre Island. She got hers for Christmas and just fell in love with it. They have a dock on a canal. So she put hers mounted on the side of it and now she just goes out, pops it in the water, does her thing and just pops it back into the wrack, then walks up to the house without having to carry it all that way.....Great wracks very reasonable priced and work like they are supposed to. I ordered two of these racks to hang my boards from the ceiling in my garage. When the boxes arrived they were heavily taped and bound together. There was minor damage to the boxes but nothing significant. Upon opening the boxes I found that both end caps and one of the screw side caps had separated from the bars. Furthermore, one of the end caps was broken in half and there was minor damage to the foam on one of the bars. Very disappointing but nothing I couldn't fix with a little glue. That's when I realized that one box was missing the 4 mounting screws. Once again, disappointing but easily rectified. It was during installation that I became angry enough to wright this evaluation. After drilling pilot holes and attempting to mount the racks I sheared off two bolt heads. That was after drilling pilot holes and using a basic ratchet set. Needless to say, very frustrating! After a trip to the hardware store for 8 lag bolts the racks went up without any problems. The only reason I gave the product three stars is because once in place the racks work as advertised. It was just a very frustrating experience. Excellent storage solution, especially for the boards you use a little less often. Keeps it’s near the ceiling and really out of the way. Bars are very sturdy and hardware included was good quality. Really easy to install, but I would pre drill the holes just to make easier and ensure you are in a stud. These are the 3rd set of racks I’ve purchased (my wife says I have a problem) from StoreYourBoard and all have been super! 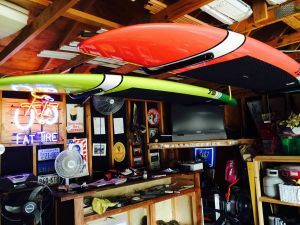 I saw a friend's garage with his paddle board stored neatly out of the way. This ceiling mounted rack was easily purchased and installed.You will need ladder,screw gun and 10 minutes. Super easy to install and store my board! Your boards safe from damage. The ceiling rack is very study for our 32-33 inch wide paddle board which hangs over the rack but still provides a very stable storage area. If I could improve one thing, I would use non marking end caps, as these might mark your board if you slide it on them. We just covered the end caps with a cloth and all is fine. We highly recommend this board - would have been five stars with non marking caps. No assembly required. Well padded although this board doesn't mind a scratch or two. Mounts securely close to the rafters and out of the way. 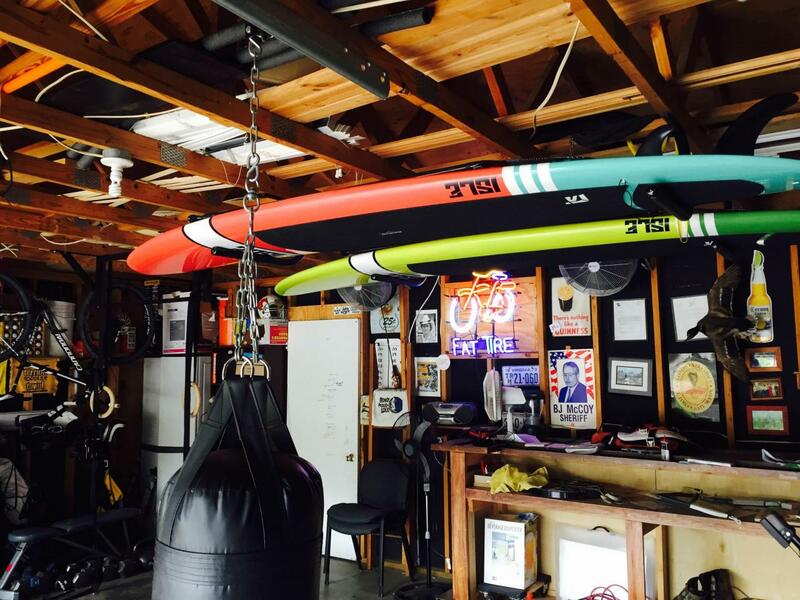 These work perfectly to store our SUP's out of the way in our garage. I love them! Great team to work with - helpful. Great customer service. I received the product quickly and in excellent condition. The product holds my 10'6" SUP and paddle perfectly. The padding protects the board. I was skeptical about the quality because the cost was so reasonable compared to other retailers similar products but it's very good quality. My husband easily mounted to our dock on the steel posts. I definitely recommend! This ceiling rack was lightweight yet plenty strong enough to hold my paddle board. It was easy to install, and the provided hardware was a good size for mounting into the ceiling joists. However, depending on your ceiling height, your own height and your board weight, it can be a little challenging lifting your board out or putting it back by yourself because it only hangs about 10 inches from the ceiling. I'm able to remove it and put it back, but only on my tippy toes, and I'm 6 ft. tall. Otherwise, great product. What a terrific product! I was sick of tripping over my boards. This storage mount allows me to get the boards up off the ground and out of sight. The quality is excellent and my only gripe is that I didn't buy more! A great product that is very simple to install and works great. Also quite a few options as to how you choose to use it - from the roof or a wall. The dealing with staff sucked and created the wrong item being delivered. Instead of dealing with the company I ordered a second pair of ceiling racks which amazingly were not even the same type as the first. I don't know how that can be but - whatever - they work. Store your board shipped the product quickly, well packaged and it looks great. Installation was a breeze and now I have wall space for other toys. Construction of the product is great. Although i love the product capabilities and how well it matches my needs i can not give it a full 5 star for 2 relatively small reasons. 1. the hardware is packaged up against the rails and now there are permanent screw/thread imprints in the foam that catch my eye every time i look at it. 2. one of the 'rails' was bent(?) horizontally so when installed it noticeably sits offset. Again, these are mostly visual discrepancies and do not appear to affect the functionality of the product. Overall, i would recommend this product. These ceiling racks are great. Easy to install, easy to put the SUP into & very secure. The board is above our cars so we needed to feel it was stable & it is. Gives our garage the clean modern look we were seeking - thank you! We love our new SUP rack! It was easy to install and works perfectly in the eves of our boat house. The end caps to have a tendency to slip off when we take the board off but that should be an easy fix. Highly recommend. I ordered four for two boards however two will do to fit both my paddle boards. The head on the screw they supplied broke off when screwing it into the rafter which was a pain to get out. The rack itself is of very god quality and the padding will save your board from scratches.....very nice product and would recommend to others. You know how your SUP is in the way of all your other stuff? 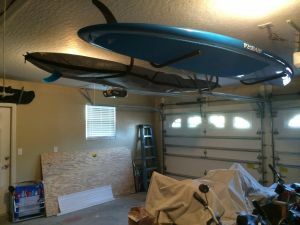 These handy (and sturdy) mounts allowed me to store my board by having it hang in the garage. When I come into the garage I'm reminded of how cool the board looks. Great way for the board to also dry. Took like 5 minutes to screw the mounts in. Would buy again as I get additional boards. Great product exceeded my expectations. Works perfectly. This is what I expected. This is a sturdy, well built mounting system. Looks and feels professional. Much better than the wall mount SUP hanger hooks. Don't waste your time with anything else. These are the mounts you want. The racks are good, but the screws to hang them with are not. I drilled a pilot hole before placing the screw. The first two I tried both broke, so I bought extra lag screws myself. As far as the racks are concerned they are good. Need better mounting hardware. I purchased 2 of these racks and they worked out perfectly in the garage. The double hangers were too deep to clear the garage door, but these singles do the job nicely. Super easy to install. Holding up well after a year. Easy to install, durable and supports my board(s). Simplistic in design, made this a no-brainer to order a second for my cruising paddle board. Worth way more than the small cost to purchase. 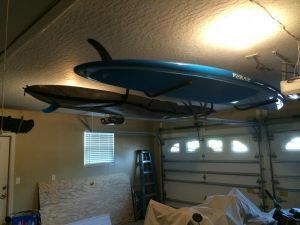 Bought a pair of these to hang my two Wavestorm SUPs from the ceiling in my garage. Install was easy (four screws), and SUPs slip right into the wide mouth of the rack. Only downside is that the racks sag a bit under load. The Wavestorms are definitely heavier than a lot of SUPs, and it isn't a huge deal -- though I did hang a "safety loop" from the rafter the rack is mounted on to ensure that the rack doesn't sag excessively. This was a must have after purchasing my SUP after moving into a waterfront apartment in downtown Austin. Keeps it high & dry, and provides a nice display of my board. I actually get comments quite regularly. If you're tight on space a ceiling mount is the way to go, and this is a bargain for the price, without looking cheap. SUP Ceiling Rack- I love it! Fast shipping, easy install, very affordable. I love the product and StoreYourBoard.com- my go to for all board storage! Thanks! I was looking for a ceiling mount for my SUP board and had read previous reviews online. This company had the best reviews and I agree. I received the package without delay and it was easily installed. The hardware and mount are as advertised. They are strong and I had no hesitation of placing my board on the ceiling. I highly recommend this product. Simple product and installation was simple. Works well, I added a bungee cord to go around it since it sits on my boatdock up high to the rafters but just in case we had some strong wind I wanted it to be secure. Rack showed up quickly and appears to be of great quality. Installation was a breeze and all hardware was included. I ceiling mounted and it holds SUP very securely. Highly recommended. Simple product, works well, instructions available on the website. Super easy to install, my SUP stays secure and out of the way. Great unit. Would have been an excellent if the bottom of the rack didn't slant down. Don't know if the board is too heavy or not but makes me a little nervous that it "could" slip off. Easy to install. The product was great and easy to install. My only issue is the rubber end caps came off too easily, but I gorilla glued these on and they work fine now. This works great for two of my wavestorm boards. All my surf buddies want one. I was excited to use this rack, which arrived promptly. Installation was straight forward. Be mindful as you look at where you plan to mount this about the direction of the ceiling truss as it will dictate direction of the board unless you mount a cross beam. Quite disappointed about how much sag there is with a 10'6" SUP. Seems flimsy and I worry they may bend enough to drop the board over time. Looking for a more sturdy option. My board is #25 and I'm fairly certain anything close to #50 would just break it. good support. easy installation. Only problem is we put them on a 9 ft overhang and it is not too easy getting them down because of the height. We are on our tip toes! These racks are good for the price paid. I would not plan on storing two boards on a set. If you have two boards, buy two sets. Easy to install - just find the bottom of the trusses, line up the holes, and put in the screws. If I never found these racks on-line, I would have probably ended up buying inflatable SUPs (which I didn't want) because I didn't have storage room on my garage walls. These rack allow you to use the space on the ceiling above the garage door. i love it, and am very happy with it. i recommend including drywall anchors as i had to buy them separately (they're cheap, but i had to go to the store...). if you include a small hook below for the paddle, it would be perfect. however, all in all, i am very satisfied. Good SUP rack for the price. Easy to mount and low profile. The hardest thing to do is to find the actual stud. After this rack is nothing less than exceptional!!! What a great Way to store two boards in an already over packed garage. Very sturdy rack. Easy to install. Holds our SUP with room on top for a paddle and other misc. items. very easy to install. It works just like the descriptions says. We used it for a 12'6" SUP. The individual hangers are installed on rafters in the garage 6 ft apart. We were looking for something that got the board completely out of the way and this did the job easily and quickly. Easy install but rack does flex slightly with SUP on the rack. Perfect for my SUP! I'm female and this rack was very easy to install, once I located the studs in the ceiling of the garage. Now my board is out of the way & out of harms way until the season here starts up again. works for my 11'6" Starboard Touring Board. 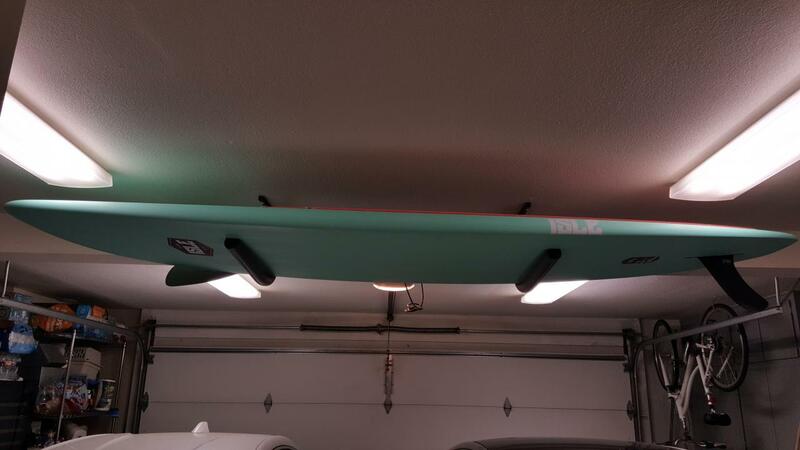 I have a tourning style SUP, so it's pretty thick (7.5 inhches, I think) and it fits in the SUP ceiling rack perfectly fine. My husband installed it and it was quick and easy. Great product, easy to attach to the ceiling, and although I have yet to remove the board from the rack myself, I don't see it being a problem. Could have longer stiffer bars. The end caps also could be glued on better. But it is functioning. 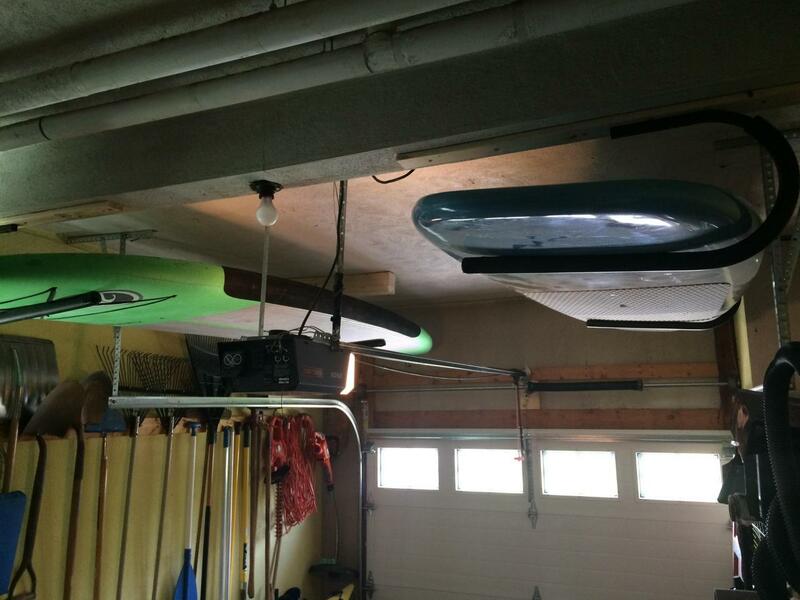 I bought 2 of the ceiling racks for our sup boards and we love them. Since they are in the main room of our cabin, it was important that they work and look good. They look great and are designed to take as little room as possible! I purchased this unit with the intent of storing my board on the ceiling of my garage however, after talking with some friends agree that I'd find it easier to access if it were on the wall. My space comes at a premium but I mounted to close to the floor and it works perfectly! Easy to install, fits close to the wall and out of the way of my car door, easy to pull out for use and is out of the sun in the summer. Love it! I have a tiny studio apartment and the only way I could store my board was to put it on the ceiling. This rack did the job perfectly. It was a simple, quick install and it keeps the board pretty close to the ceiling so the room still feels open. It is a very sturdy SUP rack, I have a 33 inch / 11.6" board and it fits fine. Installation was a bit awkward just trying to the line up the hangers so the board would hang straight, but got it worked out eventually. I only had room to store my board by hanging it from the ceiling. I thought that I was going to have to fabricate a bracket, but when I saw this "SUP Ceiling Rack", I knew that this was the ticket. It contained everything that I needed to install it as well as great padding to keep the board from getting scratched. I do wish that it was made out of a little heavier gauge steel but it is quite ample. The racks are great and easy to install. Got 2, they are great so I got 4 more. I have one big SUP 36" wide and it holds fine. Easy to get on and off. The product stores the board as advertised and mounts with ease. I purchased my own mounting screws as I am used to whatever is supplied with such products stripping easily, but the mounts I purchased are of a perfect size (not too big or small) and have the right padding and shape to do the job efficiently. 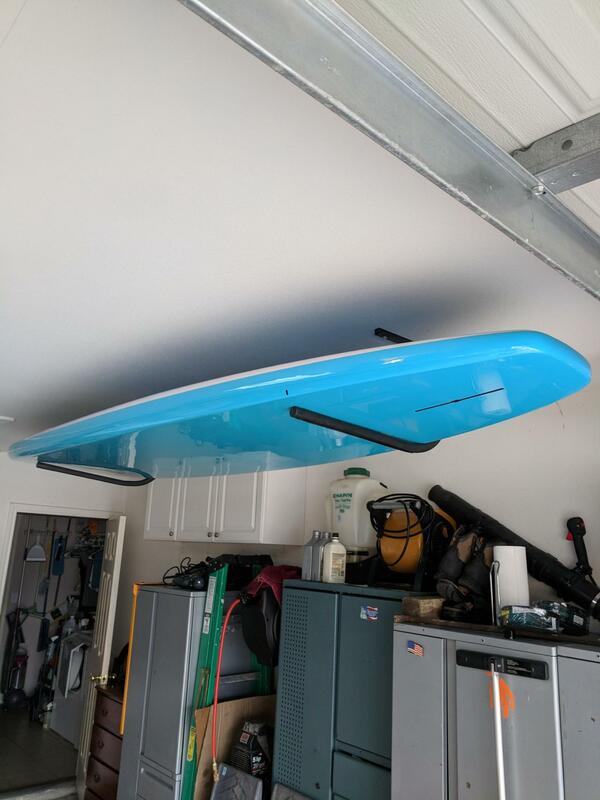 Had our SUP laying on its side on the floor in the garage. Looked around for a ceiling mount as I don't have much space on the wall. Didn't take long to mount and looks great. Took 20 min to install and they work great! 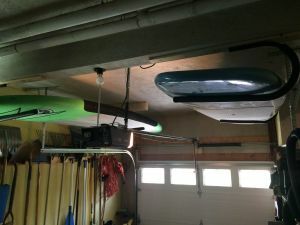 I put this SUP ceiling rack in my garage. I love that it keeps my big SUP out of the way when I am not using it. I have to use a step stool to get it up and down but it is worth it to keep the SUP out of my way in the garage. 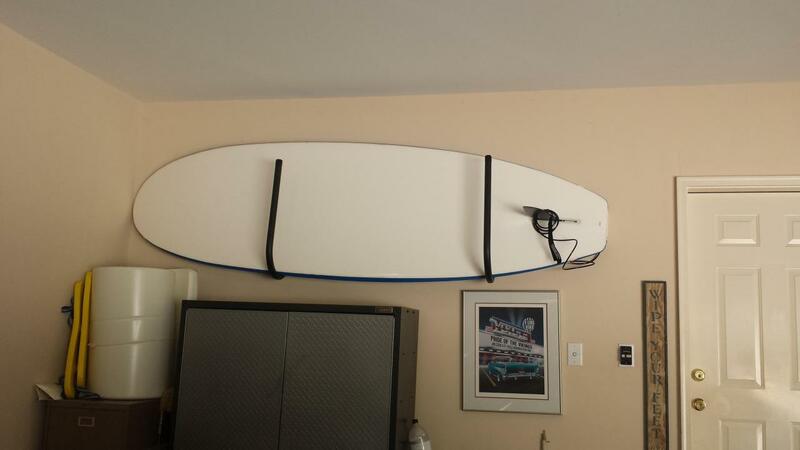 My SUP is about 32" wide at the largest point and the rack works fine with it. It hangs over the black arms some but it seems pretty secure up there.